Goalkeeper Tim Howard has signed a two-year contract extension to keep him at Everton until 2018. The United States international, 35, joined Everton from Manchester United in 2006 and is 22nd in the club's list of appearance makers. Manager Roberto Martinez said: "It is fantastic news. He has been vital to our overall achievements. "To have Tim performing as he has this season, I cannot see past him to choose the best goalkeeper in the league." Since signing from United, initially on loan before making the move permanent in 2007, Howard has played 342 games for Everton. He set a Premier League club record of 16 clean sheets in the 2008-09 campaign and has captained Martinez's side at times this season in the absence of Phil Jagielka and Leon Osman. 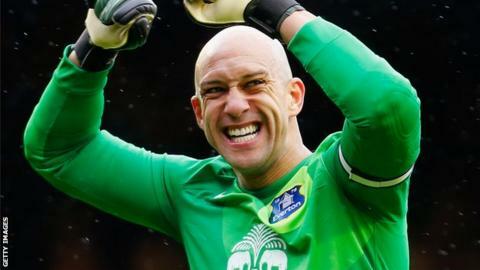 Howard's form has been a key part of Everton's pursuit of a top-four league finish, while he is set to be first-choice goalkeeper for the United States when the World Cup takes place in Brazil this summer. Martinez added: "For him, in such an important year with the World Cup around the corner, to commit his future for the long term is an incredible moment for the dressing room."